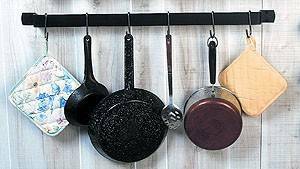 This simple strap iron utensil rack comes with 6 movable hooks for hanging your mugs, pots, small pans, can openers, spoons, or any kitchen utensil or tool! The versatility of the movable hooks is a lifesaver when you have many different sized tools to hang. Measuring 31" long, you'll have plenty of space. Pick up a few of these to keep all of your prized kitchen tools on display, and right at your fingertips!